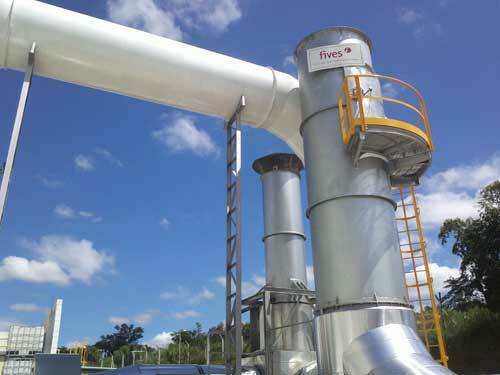 The feasibility study conducted on July 2012 highlighted the fact that, among the different available technologies, the most appropriate was the one proposed by Fives based on ITAS regenerative thermal oxidizer technology. The core of Rigetherm® is a Regenerative Thermal Oxidizer (RTO) for treatment of exhaust air and is used to destroy air toxics and VOC from industrial process exhausts. The RTO uses a bed of ceramic material to absorb heat from the exhaust gas. It then uses this captured heat to preheat the incoming process gas stream and destroy air pollutants emitted from process exhaust streams at temperatures ranging from 815°C (1,500F) to 980°C (1,800F). The basic operation of a RTO consists in passing a hot gas stream over a heat sink material in one direction, and recovering the heat by passing a cold gas stream through that same heat sink material in an alternate cycle. ITAS solution to use those 3 solvents inlet (ethyl acetate, ethyl alcohol and IPA) provides the customer with the possibility to operate in auto-thermal conditions during all the operating period and by allowing him to reach the ultimate thermal efficiency. The RTO started up on March 5 and the customer is very satisfied with the results which are compliant with the most stringent rules of environment emission requirement including EN and TA-LUFT. According to the type of compounds present in the effluent to be treated, those regulations set up treatment modalities and emission limits. ITAS’ technology is both the ultimate ecological and economical solution as there is no gas consumption during the auto-thermal operation of the equipment, and the efficiency for abatement of the pollutant substances present in the flow is maximum. The system is designed to allow any further update such as the integration of a plant outcome recovery system or a hot by-pass allowing recovering further energy through the auto-thermic system by catching hot air directly from the combustion chamber.